With its eclectic mix of craftsman cottages, Tuscan estate homes and historic horse properties, Fair Oaks, California offers each resident a piece of charming Americana. Because the area has undergone extensive development over the past 100 years, many concrete surfaces are now worn, cracked, flaked, stained or just outdated. Whether you need a few repairs or a complete concrete facelift, you must work with a decorative concrete expert who understands the local character and is willing to protect your investment. Sierra Concrete Resurfacing has been restoring driveways, sidewalks, outdoor living areas, entryways and interior floors in Sacramento County for more than 30 years. Each project plan includes access to highly regarded design consultants, long-lasting materials and dedicated work crews. Whether your job is big or small, residential or commercial, one call gets the process started: 916-631-9666. Stamped Concrete Overlays: Get the appearance of natural stone, polished wood or interlocking pavers at a fraction of the cost of new construction. Technicians apply overlays to your old concrete, so there is no need to tear out existing slabs. They also work to your specifications for colors, patterns and designs. If you want pink herringbone brick like the Serbian Orthodox Church or golden cobblestone to match the bluffs of the American River, this team delivers your design quickly and beautifully. Acid/Water Concrete Stains: Craft a distinctive look for your guest bathroom, basement rec room or infinity pool deck. Skilled technicians carefully apply your choice of pigments to produce appealing designs that last for years and require little maintenance. Concrete staining replaces the dull gray of traditional surfaces with rich tones ranging from earthy browns to wildflower blues. Since each surface reacts differently, your finished product will never be the same as a neighbor’s in The Royals or as an antique shop’s in the town center. Sundek Classic Texture: Relax outside knowing that your patio and pool look amazing and feel just as great on your bare feet. Sundek Classic Texture gives your exterior surfaces slip-resistant traction during the wet winter months. It also stays several degrees cooler than classic concrete so that you do not burn your feet during those scorching Augusts. Sierra Concrete Resurfacing proudly represents Sundek in Greater Sacramento. Chip and Epoxy Floors: If you want the rugged durability of a concrete overlay but desire a more industrial appearance, consider polyurea polyaspartic and epoxy flooring. You get a seamless installation that hides blemishes, is easy to mop, resists fading from the California sun and comes in several styles of decorative chips. Many Fair Oaks customers choose this application for garages because cars and trucks can be pulled back under cover in a little as one day. This flooring even provides protection against those chickens roaming the Old Fair Oaks Village. Only one local contractor balances aesthetics, speed, cost and the environment. Now is the perfect time to schedule your decorative concrete project and discover why Sierra Concrete Resurfacing continues to earn an A+ rating from the Better Business Bureau. 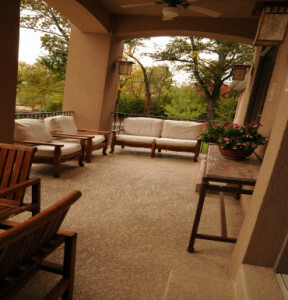 Send your questions to info@decorativeconcretecalifornia.com or dial 916-631-9666 for a free estimate. © 2012; Sierra Concrete Resurfacing, All Rights Reserved.